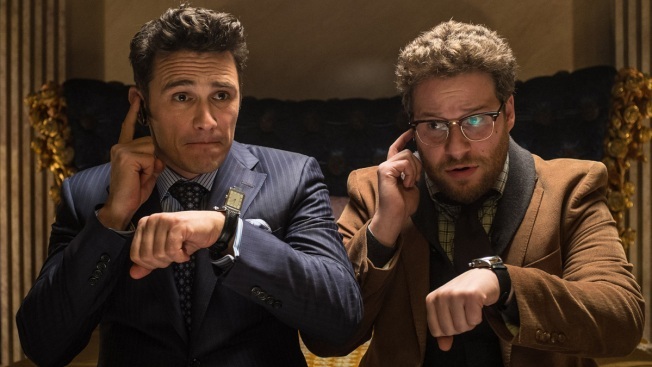 This image released by Columbia Pictures shows James Franco, left, and Seth Rogen in "The Interview." "The Interview" will open on Christmas after all. Sony Pictures Entertainment confirmed Tuesday that the film will have a limited theatrical release across the United States beginning Thursday. The Alamo Drafthouse in Texas and Atlanta's Plaza Theater had said they would begin showing "The Interview" before Sony's confirmation. Rushdie, a former PEN president, faced dire threats 25 years ago after the publication of "The Satanic Verses." The novel was condemned as blasphemous by some Muslims, and Iran's Ayatollah Ruhollah Khomeini called for Rushdie's death. The PEN petition noted that "The Satanic Verses" continued to be published and sold. Stars of the movie Seth Rogen and James Franco responded to Sony's decision on social media.